My Care Conversations app helps patients keep on top of all the complex information patients need to process on visits with their oncologist. A free smartphone application is now available to support cancer patients and their families throughout their healthcare journey, including during meetings with care providers. The My Care Conversations app — developed in partnership between Alberta Health Services (AHS) and the Alberta Cancer Foundation — enables patients to record their conversations with their cancer care team to help them remember and confirm what was discussed. “Research shows patients may forget up to 80 per cent of healthcare information discussed at clinic visits,” says Mauro Chies, AHS Vice President of Cancer Control and Clinical Support Services. “The Alberta Cancer Foundation is pleased to make this investment on behalf of our donors,” says President and CEO George Andrews. In Alberta, patients have the right to record their clinical conversations. 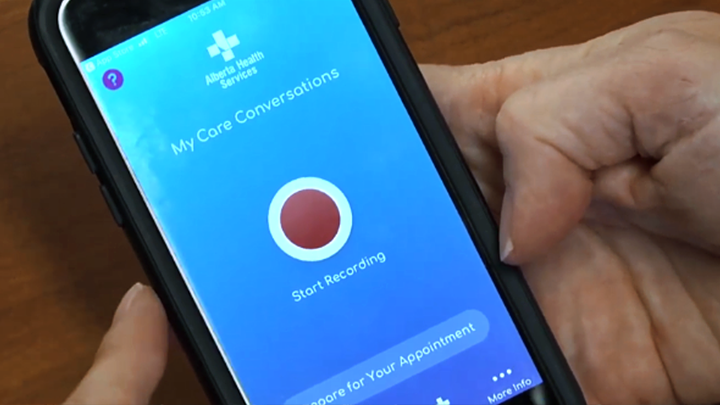 My Care Conversations has been developed with specific security features and functions that go beyond a standard recording app on a smartphone. Cliff Roberts, who was diagnosed with Stage 4 prostate cancer in August, was the first patient to download and use the app during his initial appointment at the Tom Baker Cancer Centre. "Both my wife and I thought it was an awesome idea," he said. "When you get into a consult like that, you can't take everything in. And to have that on tape, it was awesome, because we were able to go back after the initial interview and listen to it and get things out of it." Roberts also said the app helped him go back to the recordings and listen to the type of medications mentioned, and from that, he and his wife could conduct further research on the medications. “At Alberta Health Services, we want to empower patients and families take a more active role in their healthcare — and this app will help achieve that,” says Chies. My Care Conversations is available for download on the App Store for Apple devices, and on Google Home for Android devices. See AHS web for more information.